Sadhus belong to many different sects or orders. Upon joining a sect, an apprentice-sadhu must undergo an initiation-rite, which is regarded as a symbolic death -- and a rebirth. He dies from his former, earthly life and is reborn into the divine life. The visible symbol of this rebirth is the shaven head of the novice. After initiation, any talk or thought about the former life is discouraged; the past is irrelevant now and age is reckoned from the new birthday. The bond with the guru is now all important. He is the 'dispeller of darkness', the guide for piercing the Veil of Illusion. The guru is father, mother and teacher -- and the disciple worships his guru as god incarnate. Saraswati Giri is a real master at the damaru. He rattles two different-sized drums simultaneously, each at a different speed, creating a specific rhythm. It is an active form of meditation and performing it for any length of time requires great concentration and physical strength. 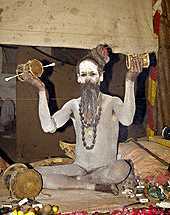 Naga sadhus are a large and a prominent Shaiva sect, who have existed since the prehistoric past. The Naga sect is subdivided into Akharas, i.e. 'regiments', like an army. Their display of weaponry -- sticks, spears, swords and especially the trident -- have a mostly symbolic function. Among the Nagas are many sadhus who walk about naked. High up in the icy Himalayas, but naked all the same, Bhola Giri Nagababa blows the serpentine horn, called nagphani, or 'cobra-hood', producing one piercing note. This instrument is related to the cobra (naga), the intimate companion of Lord Shiva, always coiled around his neck. In their nakedness they do not emanate sexuality. On the contrary, they control, inhibit the sexual 'vibrations', retaining its energy so it can be mystically transformed into psychic and spiritual power. 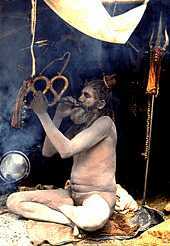 The chilam, a clay pipe smoked by many sadhus through cupped hands, is filled with tobacco and hashish. Abbé Dubois, a French missionary who lived in India from 1792 to 1823, observed in his Hindu Manners, Customs and Ceremonies: "they attach to their generative organs a heavy weight which they drag about until the power of muscles and nerves is completely destroyed." These asanas are still practised today.